Performing the vocal EQ’ing process time-and-time again, have you ever wondered if there was a better way? I’m a process freak. However, I’ve found the best way for improving a process is starting a new one from scratch. That’s how I arrived at the following process I use for mixing my vocals. Throw out the stuff you don’t need. This is usually broken stuff and stuff you don’t want. Clean up the stuff you need. For example, clean up your workbench by putting the tools away. Improve the existing organization. For example, move the trash cans closer to the garage door while moving the recycling bin next to the door to the house because you are always tossing recyclables in there throughout the day. The last time I cleaned out my garage, I threw out my regular process and started from scratch. I drew out the dimensions of my garage on a piece of paper and sketched out where everything should ideally be located for efficiency and increased floor space for parking. For example, the recycle bin was put by the back door and the lawn mower was put next to the garage door for easy access. During my cleaning process, I had a reason for moving and cleaning; creating an efficient order wherein less space was required for the same stuff. Take your current process of cleaning up your vocals and toss it aside. 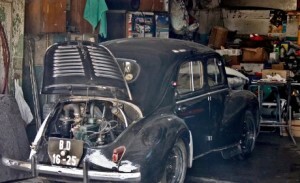 Let’s now look at how you can apply the same process I used for cleaning my garage. Your vocal EQ controls will be your EQ knobs for low, mid, and high frequencies as well as a high pass filter (HPF). My first step is turning on the HPF. First of all, there isn’t anything in that super low-end, coming from a vocalist, that’s going to be beneficial…unless of course I was mixing Barry White. Secondly, in case your vocal microphone is picking up any low-end frequencies on the stage, you will have those removed from the channel. At this point, let’s say you need the vocalist’s full range of frequencies. This includes everything from around 80 Hz to the high harmonic frequencies. Focus on cutting out the bad frequencies such any sibilance you hear in the 5-7 kHz range. You might have a singer with a harsh sound so you cut bit with a narrow bandwidth somewhere in the 2.5 kHz to 4 kHz range. They might need a bit more bass in their voice so you boost in the 200-600 Hz range. Sound organization, regarding vocals, is about getting the vocal to fit where it belongs. Let’s look at a lead vocal and a background vocal. The lead vocal needs to belong on its own. It needs to stand out from the background singers. It needs to be clearly heard so the congregation can easily hear what’s being sung. Considering these needs, you need to mix the lead vocal channel against the other vocal channels. You might have to change your settings from step two, but that’s OK. Focus on the mid-range frequencies. Also, look for a boost in the high frequency range. Boosting high frequencies above 8 kHz will add what’s called “air” or “breath-iness.” Such boosting will add clarity to the voice. High frequencies boosts also give you a form of spacial separation in your mix – don’t think it’s only reserved for lead vocals. The background vocal(s) need to be organized together. Imagine four background vocals as producing a single voice. This voice doesn’t have to be clear. It doesn’t even have to take center stage and in fact it shouldn’t. The background vocals should support the lead vocal by giving depth to the song. Mix these channels together for a unified sound. It’s also a great place to later add a nice bit of reverb for that depth. Long ago, my process for EQ’ing vocals was about turning knobs until it sounded like I wanted. I had a process for it, but it wasn’t the best. If I recall, the HPF wasn’t even engaged until I was done with my EQ knobs. Then one day, I tossed that process out the window and started from scratch. My new process became the three-step process of pitch it, clean it, and organize it. Not only do I get significantly better sounding vocals but the time I spend eq’ing vocals has dramatically decreased. Better vocals in less time…isn’t that what everyone wants? 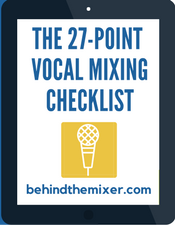 Check out the Mixing Vocals Guide. Create great vocal mixes that stand out in the mix, fit within the music mix, and give the singers exactly what they need in their monitors. I’ve been doing some very heavy EQ on vocals lately. Cutting all over the place. I’m liking the results well enough, but I keep feeling like I’m over-doing it. Sometimes I feel like I need a 6 or 8 band dynamic EQ for each vocalist because I find so many areas in the frequency spectrum that can really sound annoying (boomyness at 80Hz, muddyness at 300Hz, harshness at 1KHz and 4KHz, excessive sibilance at 8KHz and up) and I wind up wanting to cut in nearly all of these ranges. Although in many cases I’d prefer a dynamic EQ or multiband comp, because I only want to reduce that frequency when they get too loud. Am I missing something or is this just sometimes necessary? Brian, it’s a tough call without hearing the mix. I’ve got a musician who I’ll give a really heavy high pass filter around the 200 Hz mark and then a deep cut around 300, outside of that, that’s all it takes. I don’t even boost much of anything for his voice. The danger of a lot of cutting all over is you start to take away the singer’s uniqueness. But then, I’ve had the occasional singer where I would cut a little here and there and more over here and more over there…and there voice sees so unique that it seems bad when it actually, it’s who they are. That’s a long way of saying, sometimes it’s necessary to cut a lot and sometimes their unique vocal characteristics are the real heart of their voice. In the later case, cut out the really harsh stuff and listen to what remains. What could you change in your mix, in other channels, that would support their uniqueness? Something to consider. Yeah, I know what they mean about needing the lows. I, as a bass singer myself, like to “feel” the song, my voice, and the key. When you’re dipping below 70 or 80 Hz, it helps to “feel it” to know if you’re on pitch. A “E-1” ( 3 “E’s” below middle C, approx. 41 Hz) is easy for me, and it sure helps you find the notes when the subwoofer system is reproducing sound clearly (Not muffled, like most sound I’ve heard), distinctly, and powerfully. It also helps to remove some low mids (above 100 Hz), cause if you don’t, those frequencies overpower a bass singer’s voice when they go down an octive below it. You notice in the first video how the bass vocalist’s volume drops when he takes the verse’s last line an octive lower. This is evidence of the Fletcher-Munson curve. The human ear needs deeper frequencies boosted to hear them equally. Other than a bass singer, yes, by all means, use the high-pass on vocals. It helps leave room for the speakers to reproduce what is actually “down there”, what we want to hear. Start watching at about the 53 second mark through the end of the video. The audio starts at the 16 second mark. If he has the range to sing below the high-pass filter, like these gentlemen in the YouTube clips, leave it off to start with. If there is “popping”, turn it on. The “b”, “p”, and “t” polosives are distracting, and aren’t worth putting up with. With the low-cut filter on, then boost the channel’s low EQ band a-bit, making sure that it doesn’t get muddy. A great bass vocalist can sing actuall notes down below 50 Hz , and sound great. Many songs in the Southern Gospel genre call for the bass singer to lay down very low harmonies that add quite a bit of impact to the group’s delivery. Don’t ruin his preformance by low cutting him at 80 or 100 Hz. Quaid, thanks for the specifics on this. I suppose the Barry White comment might have been a bit too obscure for the low end reference. Perhaps I’m showing my age. I mix for a men’s choral group every couple of months…not only do they need the lows but they say that’s how they tend to follow the other singers and stay in key.